There’s no getting around it, Auto-tune is in our blood as a collective. It’s used both heavy handed as well as subtly and the EFX version is a quick way to correct some slight flaws and provide an icing on the track. Yes, it’s a sad state of affairs when every track has to be pitched to perfect scale but it’s not Antares fault. I actually use Auto Tune EFX quite a bit after I’ve used Melodyne on pop tracks to give it that perfect sound but you can take it much further with rhythm based triggering effects. Overall I use it more than Auto-Tune 7. 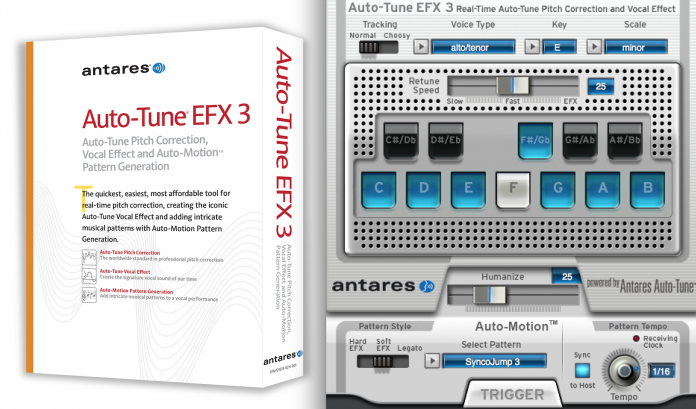 (Scotts Valley, CA, April 22, 2014) — Antares Audio Technologies today announced the introduction of Auto-Tune EFX 3, the third generation of their easy-to-use tool for real-time pitch correction and creating the iconic Auto-Tune Vocal Effect. Powered by the same core technology as Antares’ professional standard Auto-Tune 7, Auto-Tune EFX 3’s new variable Retune Speed and Humanize controls provide an entirely new level of natural, realistic pitch correction. And with its unique Auto-Motion Vocal Pattern Generation, stunning new vocal effects are only a mouse click away. Designed to make almost everything automatic, Auto-Tune EFX 3 is the most affordable vocal production tool that provides Antares’ world-renowned real-time pitch correction. Users just set the key and scale of their track, adjust the Retune Speed for their desired effect, and Auto-Tune EFX 3 does the rest. For songs with complex chord progressions or modulations, they can optionally set up custom scales or use their host’s automation facility to allow the processing of virtually any vocal line. New in Auto-Tune EFX 3 is a fully adjustable Retune Speed control that lets users fine tune the desired effect for their track, from subtle natural pitch correction to the full-blown Auto-Tune Vocal Effect. Also new is Antares unique Humanize function that ensures that short notes are effectively corrected while sustained notes are allowed to preserve their subtle pitch variations for the most natural, realistic pitch correction possible. Auto-Tune EFX 3’s Auto-Motion Vocal Pattern Generation is a unique effect that adds intricate musical patterns to a vocal performance. Patterns are selected from a built-in (and expandable) library in a variety of styles and can be synced to the host’s tempo at various beat divisions. At any point in a vocal track, a user can simply click the Auto-Motion Trigger button to send their vocal on a melodic adventure. And since Auto-Tune EFX 3’s patterns are stored in standard MusicXML format, users can use any application that can open and edit MusicXML files to edit existing patterns and create entirely new patterns of their own. Auto-Tune EFX 3 is available now in AAX Native, VST3 and Audio Unit versions for Macintosh and AAX Native, VST3 and VST2 versions for PC. All versions are 64-bit compatible.